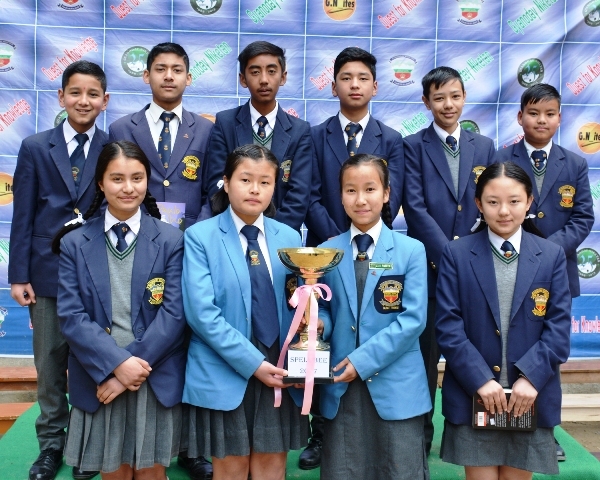 An Inter-House Spell Bee Competition was organized on 18th March 2017 in the school assembly area. This competition was one out of the numerous enjoyable competitions that give students a platform to learn spellings.It help students improve their spellings, increase their vocabulary, learn concepts, and develop use of correct English. As a result, children are able to read and write more effectively and score well in tests. It is important that children learn and can say the correct pronunciation when they are learning a new word so that they store it correctly in their brains .Children’s brains are like sponges – the more vocabulary they are exposed to, the stronger their language and literacy skills will be. The contestants are asked to spell a broad selection of words, usually with a varying degree of difficulty. A draw of lots at the beginning of the competition determined the order of appearance. The speller’s time at the microphone had a limit of 2 minutes. Students participated with great enthusiasm and they dueled through the toughest words Their efforts and initiative was appreciated by all.It was a wonderful learning source not only for the participants but also for their peers.It also helped in enriching the vocabulary bank of the students. Kudos to all the participants and thanks to Ms.Sailika Thapa for organizing the event. The result were as follows: 1st- Simran Rai (ONYX) / 2nd- Rajmani Darnal (ONYX) / 3rd- Pranab Rai (TURQ). Overall House Results: 1st- ONYX / 2nd-TOPAZ / 3rd-TURQUOISE / 4th-GARNET.